The coastal city of Nha Trang is the most attractive destination in Asia to beach lovers with long white sandy endless beaches, numerous islands and the cultural heritage is well preserved. Ideal for beach and nature lovers, Diamond Bay Golf & Villas is beautifully located on the bay of Diamond, Nha Trang – one of the world’s 30 most beautiful bays voted by Forbes Magazine. It. 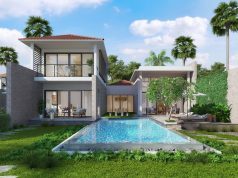 is 20 minutes away from Cam Ranh Airport and only ten minutes away from the city center. The location is brilliant – close enough to the city for convenience, but far enough to immerse yourself in secluded paradise. Andy Dye -US course designer, nephew of Peter Dye, designed this course in a bold and confrontational fashion and it opened for play in 2011. 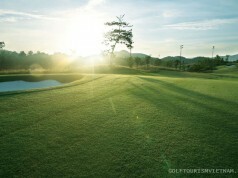 He said: “With its unique location, exclusively set on the convergence of the subtle beauty of the natural, lean on the mountain – face to the ocean, Diamond Bay Golf & Villas is one of the few greatest golf courses in Asia possessing the beautiful view. In here, golfers can smell the freshness from Platinum TE Paspalum grass combined with the clean fresh air of the tropical sea and practice your skill in front of the magnificent view of the ocean. The course covers the area of 76 hectares, natural wetlands, majestic pines and sandy dunes are in contrast with the rich fairways. The signature par-3 hole twelve is nicknamed the “smiling hole” as it is surrounded by rock wall from the tee off to green island, with greenside pot bunkers and a large falt bunker from the water edge and appears like a cheerful smile. Hole 18 is also an outstanding completing hole that needs 3 precise shots to reach the green in regulation on this 546 garden par-five. The large and undulating green will require the golfer to put their trust in their putter to make par or bidie. 132-yard par 6 hole 6 is one of truly beautiful par 3’s on the course with fantastic views of the surrounding mountains. On the other hand, par 4 9th hole is the most challenging hole on the course as the green is long, countoured and well protected by bunkers on the right and water on the left. Being the first hit to the sea driving range in Vietnam, what Diamond Bay Driving Range has to offer is unique to the industry and are excited to serve the golf community. The resort has 342 international standard rooms, a large capacity conference room, and a world class spa. It aslo offers a wide variety of activities and has a range of equipment available to you for relaxation, games and sports to enjoy on your luxury holiday. Guests can wallow in the blue sea or take part in many water sports such as Banana boat, Snorkeling, Kayaking, Parasailing, Jet Skiing. Address: Phuoc Ha Hamlet, Phuoc Dong Commune, Nha Trang City, Khanh Hoa, Vietnam. 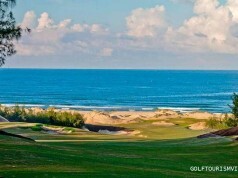 Keyword: diamond bay golf,diamond bay golf resort, diamond bay golf villas.